Tessup Lake | Northern Wilderness Outfitters Ltd. This lake is located about 50 miles north of our airbase. For the fishermen who do not like to fly, this is the lake for you. A 25-minute airplane ride will land you on one of Ontario's abundant fishing lakes. We have two cabins on this lake. 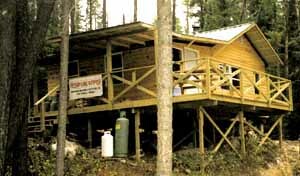 One cabin is located on the north end of the lake on a small island and can accommodate a party of 8 fishermen. 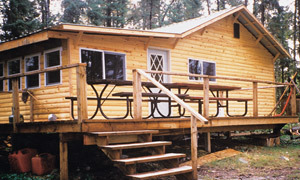 The other cabin is located on the south end of the lake and can accommodate a party of 4-6 fishermen. Tessup Lake is about 4 miles long and a little over 1/2 mile wide. You can also go up a small stream and fish for walleyes and northerns in Peninsula Lake. 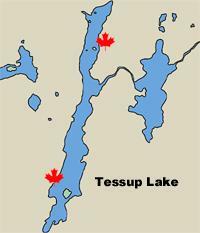 Tessup Lake is noted for its excellent walleye and northern fishing. Every year this lake will produce 8-pound-and-over walleye and 15-pound-and-over northern. Some of the nicest stringers of fish come out of this lake consistently every year. We feel that the reason Tessup is such a top producer of fish is the countless number of small streams that empty into this rocky and narrow lake. Because of the shorter flying distance, we have kept the cost of this trip low so that everyone who has dreamed of a Canadian fly-in fishing trip can afford to go. If this is your first fly-in trip or your 20th, Tessup Lake will not disappoint you. Party of 2-3 $1275 ea. U.S.
Party of 4 or more $995 ea. U.S.